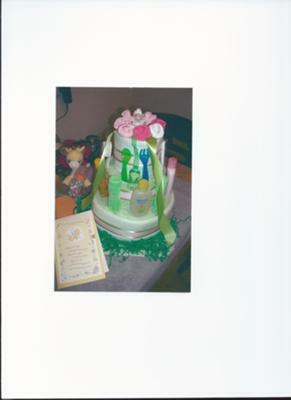 Take a look at Lori's cute diaper cake! Her use of colors and accessories bring some great colors into the cake and I was so impressed with her cake topper: darling little baby sock roses. How cute! Lori has added her diaper cake to our fabulous diaper cake gallery - a place for all of us to come and get ideas and inspiration for DIY diaper cake projects. We have the most thoughtful readers who want to share what they have created to "pay it forward," just like Lori! Thanks so much for sharing your creative diaper cake, Lori! Made for my friend at work who is having a girl. This is my first diaper cake. Sorry if the picture doesn't turn out right, i used my scanner for the first time today.